Buy iNO One Plus Dual Sim Non Camera Android Smartphone Review & Price. ~ All 4G Non Camera Smartphone Mobile Phones Without Camera Phone. Buy iNO One Plus Dual Sim Non Camera Android Smartphone Review & Price. The iNO One Plus Non Camera Smartphone with dual sim and 3.5G feature comes with 4 inch multi touch IPS capacitive screen and Android v4.0.3 Ice Cream Sandwich Operating system. 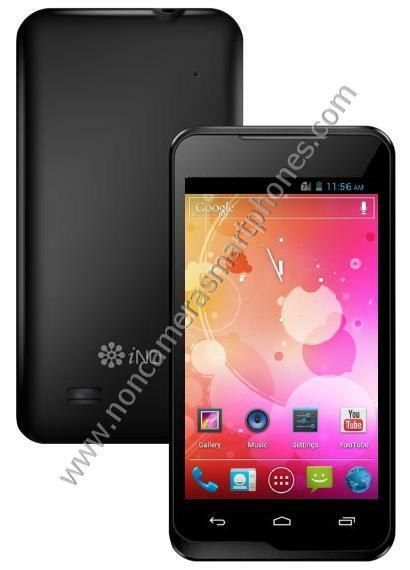 The phone dimensions are 124.5 x 64 x 11 mm and the model weighs only 150 grams. The screen display gives a resolution of 480 x 800 pixels with diagonal 4.0 inches 5 touch screen and Brilliant 16M colors and good wider viewing angle. 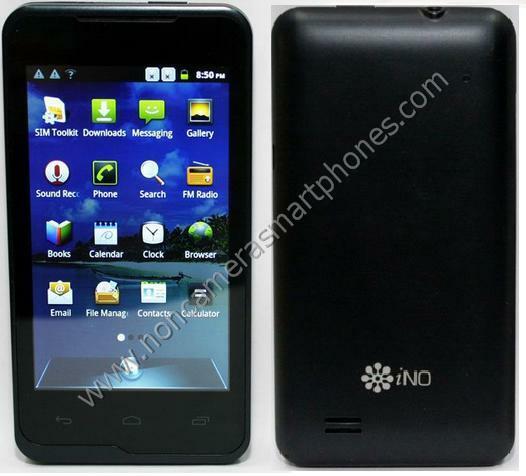 The non camera Android 3.5G Smartphone comes with Qualcomm 1.2 GHZ Dual Processor with 1 GB and 2 GB USB internal phone memory and 512 MB Ram. The phone supports external memory card slot of TransFlash microSD slot which supports up to 32 GB of external memory. The GPU graphics processing unit used in the cameraless smartphone is PowerVR SGX531. The phone uses a standard Li-ion 1450mAh battery which provides a talktime of 8 hours and standby time of 200 hours. The chipset motherboard used in the 3G smartphone is MSM8225. 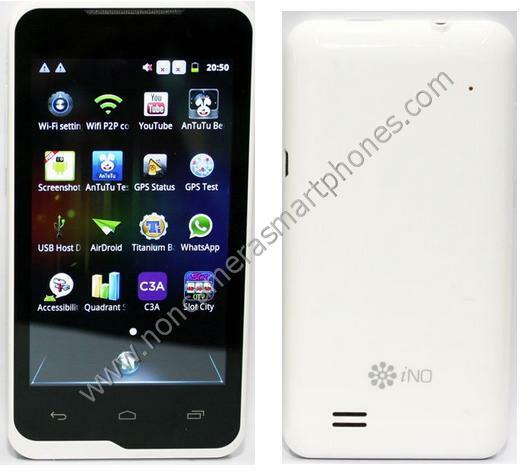 The smartphone without camera android model comes in only black and white color. Explore iNO One Plus Dual Sim 3.5G Android Cameraless Smartphone with 4 inch multi touch IPS capacitive screen Features, Specifications, Images, Photos, Comments, Review & Price in 2013 in India. The phone supports GPRS, EDGE, 3.5G, bluetooth3.0, dedicated GPS, WLAN Wi-Fi 802.11 a/b/g/n, USB, FM stereo radio and recording, audio video support and games. The android smartphone works at a 2G frequency of GSM 850 / 900 / 1800 / 1900 and 3.5G frequency of WCDMA 2100, HSDPA of 7.2Mbps & HSUPA of 5.76Mbps. The mobile supports active dual sim feature. SIM 1 supports 3G and GSM whereas SIM 2 supports only GSM. The phone supports android applications like google play, whatsapp, viber and skype messenger for chatting. The phone comes with internal decicated GPS which can work without any internet. Also check for BlackBerry BB 8800 and iNO One Dual Sim 3.5G Non Camera Android Smartphone Features, Specifications, Images, Photos, Comments, Review & Price in India in 2013. 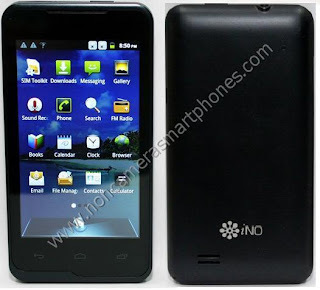 Features and Specifications of iNO One Plus Smartphone. 1 GB + 2 GB USB & 512 MB Ram. 480 x 800 pixels, 4.0 inches, 16m colors.